I am very, extra glad that I do not live in a jail cell. But I still got them! We're glad you're not in jail too! Love those photos!! Daisy, I think regular prisoners don't even get treats at all! So it is twice as good that you are not in jail. You are such as good kitteh, you don't belong in jail! As for Mr. Shrill, well, that's another story! We are glad you are not in jail too. 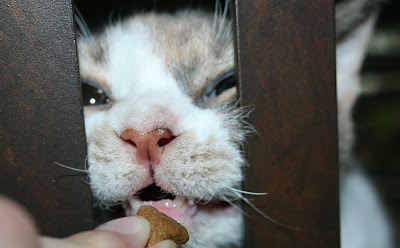 When our Beans go on holiday we have to go in our jail cell, but our holiday auntie comes inside and gives us treats. Jail is no gud. Well... except for the treats. The end. There are lots more reasons why jail is no good, but you don't have to worry about it - you won't go to jail! We're glad you're not in jail either! You're only allowed visitors like ONCE a week! We are glad you're not in jail because we don't think they let you have cameras there. How would we all get to see your cute little loveheart nose without a camera?! We're gonna hafta teleport over and break you outta there, Daisy! Daisy, we are glad that you aren't in jail too! You are much too sweet! Glad you got those treats! 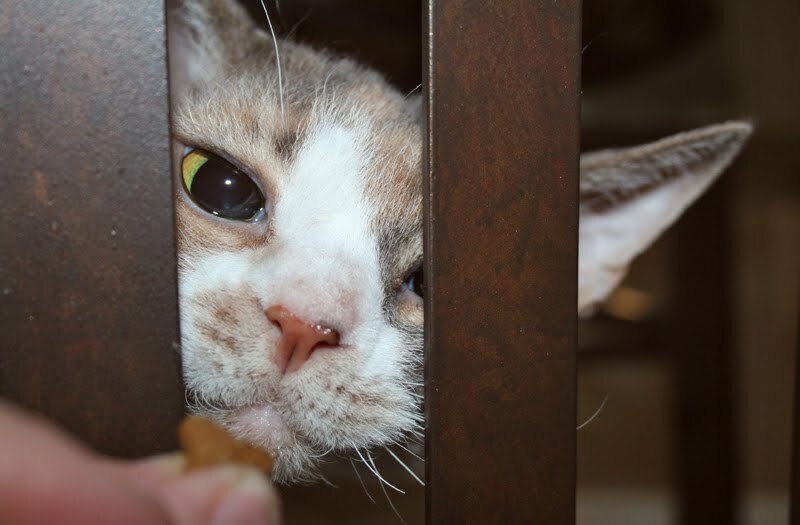 You've got a tough warden down there to make you work for your treats through bars. We're glad you aren't in jail too. We're purrty sure they don't let you wear sparkly dresses in jail. We is glad yoo is not in jail too! Boy it wud be hard to eat like dat all da time. We are so glad you aren't in jail either Daisy! Jail is no fun! Me (Clarissa) used to get put in kitten jail when she was itty bitty. I'd get the crazies and get so wound up that mom would but me in the bathroom and shut the door so I would settle down! daisy, you are so silly! i am very happy you managed to get your treat! Oh Daisy, you're just way too cute to ever end up in jail! Dausy we're so pleased you aren't in jail - we don't want your to be treat deprived. How did you land in jail, Daisy? 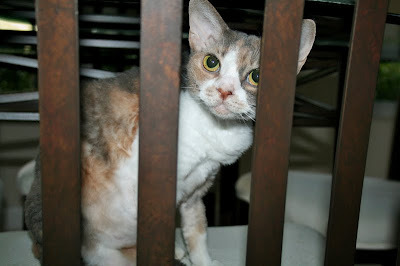 oh, sugar-kitty, if you were in jail, you shure wouldn't be lonesome--efurrycat would wanna be in there wif you! you make efurrything fun. an' we bets you'd decorate yer cell all pink an' girly, so it'd even be a NICE place to be. You had to work extra hard for your treat..hope you got an extra one! "I'm not goin' back to juvie!" 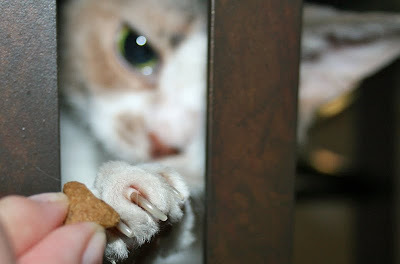 There is no keeping a kitty from her treats! You are a very resourceful cat Daisy. I am glad you still got your treats Daisy. Treats are very important! We are glad you are not in jail 2. Come enter our contest Daisy. We love that you still got the treat! And the close up of your face made our Mummy squeal! Kenji says jail is no fun. OMG! I LOVE that kitty cat - she is SO cute..
Yoo don't belong in jail Daisy, Harley either! No kitty should be in jail...dey should all haf a nice home to live in. Good kitties like you would never be in jail! Get your tin cup and bang those bars until the jailer lets you out! We are glad you are not in jail too Daisy! We hope you were able to get that treat eventually! The good news is that even behind bars you look super cute! I love you Daisy. You made me smile real big today. And I needed that. I'm glad you aren't in jail too Daisy. 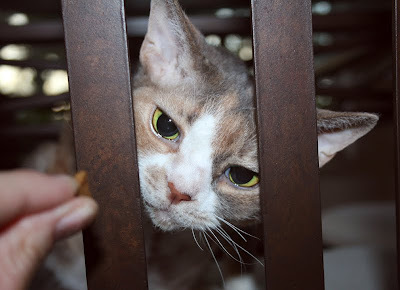 You sure are a clever one though figuring out how to get treats between the bars. my mama said that she voltrees in a jail and she helps teach commaction and leadership skils leading to building self condednce. We are glad you aren't in jail either Daisy! We are glad you are not in jail, too! Yup, and the cold steel litterbox is so verreh, um, "exposed"! Oh Daisy, I've never seen you so sad! Daisy, what did you do??? Behind bars an beggin fer treats? Surely, you did not hurt Harley for beatin ya "to the draw" yesserday! A life of crime never pays, Daisy. Maybe Mr. Shrill will find that out one day! Good job getting the treats, Daisy! I like to see a cat triumph over adversity! Well done for getting those treats. My dear, you are far too lovely to spend time in jail. We'd sell our noms to get your bail!! Hi, Daisy! I miss you!!! I agree it would be a bit more difficult to get treats behind bars. However, I am sure Mommeh would make sure wherever you are you would get plenty of treats! I kunfess, sumtimes I git urjes thinking abowt yoo being in jale, and me being yer prizzin gard. But I woodn't wunt yoo to reely be in jale.